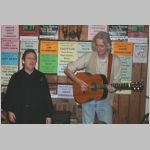 Listen and You Shall Hear is a show about the folk song collector Lucy Broadwood gleaned from letters to and from her friends as well as her diaries and is performed by Irene Shettle narrator, vocals and duet concertina and Ralph Jordan duet concertina, guitar, bouzouki. Such is the legacy of her collecting that many of the songs and tunes will be well known to you. See url below.